Ok, ok. I was supposed to explain how to make t-shirt yarn this post. I'll do it tomorrow - I promise. 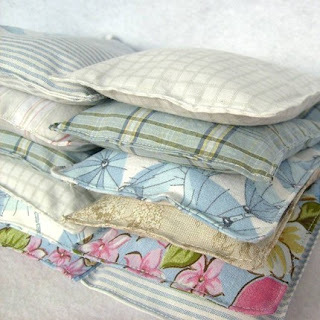 But for now, look at these great eco-friendly dryer sachets filled with lavender from ReFabulous. I bought some of these a few months ago and LOVE them. We are a family of allergy sufferers, just like most families living in Central Texas, so I've always stayed away from the dryer sheets. But these are sooo wonderful! Lots and lots of creatively upcycled products in this shop. Go look!